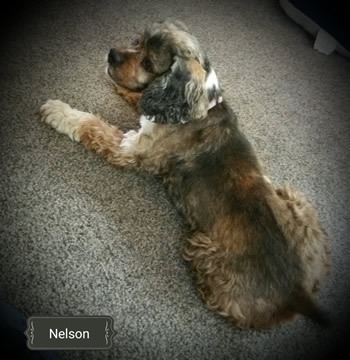 Nelson [Adoption Pending] is an adorable sable with striking coloring to match his gregarious personality. Nelson has two speeds, on and snuggle. When he is on, he will happily follow you and assist you in any chore. He will be by your ladder if putting lighting in the barn, chasing your broom if sweeping the deck, and leaping at water droplets when watering the flowers. If he finds a puddle or even a bath tub, he will have to dragged out of it. He is a water dog at his heart. His personality is one of just absolute commitment to living and enjoying life to its absolute fullest and his enthusiasm and will cheer the hearts of everyone in his family. And, if that isn’t enough, when you sit for the evening, he will hop up gently on your lap, put his head on your chest and gaze into your eyes with a look of shear appreciation. And, as if he couldn’t get any cuter, he snorts when he gets excited and really saws some logs when he sleeps. Nelson is just eight years old but zooms around my younger dogs. He has a front “elbow” injury that healed a little funny, so he runs like a rabbit, a bit more hopping than running, which just adds to his charm. He favors his better leg, and after a long day of activity, its more apparent. He is on a natural pain reliver and seems to do very well. He likes other dogs, is wicked smart and learns routines and commands quickly. He is so light on his feet and being only 20 pounds is a pleasure to walk on a lead. He is crate trained but prefers couches and comfy chairs and company of his people. 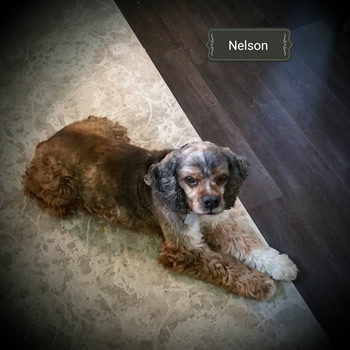 Nelson is a little heartbreaker who also happens to be housetrained, dog door trained; and so very ready for his new home.